Explain to your counselor the most likely hazards you may encounter while participating in climbing and rappelling activities and what you should do to anticipate, help prevent, mitigate, and respond to these hazards. Show that you know first aid for and how to prevent injuries or illnesses that could occur during climbing activities, including heat and cold reactions, dehydration, stopped breathing, sprains, abrasions, fractures, rope burns, blisters, snakebite, and insect bites or stings. Identify the conditions that must exist before performing CPR on a person. Present yourself properly dressed for belaying, climbing, and rappelling (i.e., appropriate clothing, footwear, and a helmet; rappellers can also wear gloves). Explain how the difficulty of climbs is classified, and apply classifications to the rock faces or walls where you will demonstrate your climbing skills. Explain the following: top-rope climbing, lead climbing, and bouldering. Evaluate the safety of a particular climbing area. Consider weather, visibility, the condition of the climbing surface, and any other environmental hazards. Determine how to summon aid to the climbing area in case of an emergency. Describe the kinds of rope acceptable for use in climbing and rappelling. Show how to examine a rope for signs of wear or damage. Discuss ways to prevent a rope from being damaged. Explain when and how a rope should be retired. Harnesses. Correctly put on a commercially made climbing harness. 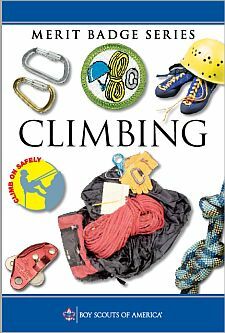 Explain the importance of belaying climbers and rappellers and when it is necessary. Belay three different climbers ascending a rock face or climbing wall. Belay three different rappellers descending a rock face or climbing wall using a top rope. Show the correct way to tie into a belay rope. Climb at least three different routes on a rock face or climbing wall, demonstrating good technique and using verbal signals with a belayer. Using a carabiner and a rappel device, secure your climbing harness to a rappel rope. Tie into a belay rope set up to protect rappellers. Rappel down three different rock faces or three rappel routes on a climbing wall. Use verbal signals to communicate with a belayer, and demonstrate good rappelling technique. Climbing. All climbing, belaying, and rappelling exercises and activities must be supervised by a rock climbing instructor who is a mature and conscientious adult at least 21 years old, and who is trained in BSA Climb On Safely and understands the risks inherent to these activities. Training as a BSA climbing Level 2 Instructor is highly recommended. Someone with certification in First Aid/CPR/AED from the American Red Cross (or equivalent) must be present at these activities.